The Alexander was the largest convict transport vessel in the First Fleet. She weighed 452 tons and was 114ft/34.75m long by 31ft/9.5m wide. 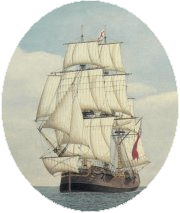 She transported 30 Crew, 41 Marines and 177 male convicts on her voyage to Botany Bay. A few free settlers – wives and children of the marines mostly, also accompanied the Alexander on her voyage. The 30 crew returned to England, whereas the convicts and the marines stayed in Botany Bay. John Allen was convicted of Theft of a trunk, bed curtains, valances and other items at Herford Court, England. He was tried along with his wife, Sarah Allen for Grand Larceny. Sarah was acquitted of the charges but John was convicted and sentenced to 7 years transportation to Botany Bay on the Alexander. John was a 45 year old Miller at the time of conviction. Robert Abel was convicted of theft with violence and highway robbery with a pistol at the Old Bailey Court in England. He was sentenced to death by hanging, however, this sentence was changed to 7 years transportation aboard the Alexander in the First Fleet.